Personality:Aggressive, Silent but nice when befriended. Tactician at heart. 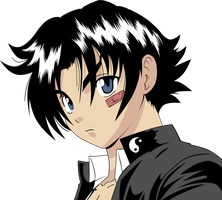 History: born in the mist village, Kraun was groomed too be the perfect ninja he was trained in taijustu, kenjustu, genjustu and ninjustu in perfect balance not favoring the one anymore than the others. When it came time for him too take the genin exam he passed like everyone else killing his classmates and going on too obtain his headband.